Carrot Cakes with Cream Cheese Icing, Lemon Poppy w/Ginger Muffins, Cranberry Muffins, Oatmeal Cream Pies, Chocolate Chocolate Chip Cookies, Apricot Almond Cookies(gluten/soy free) and more at the co-op. 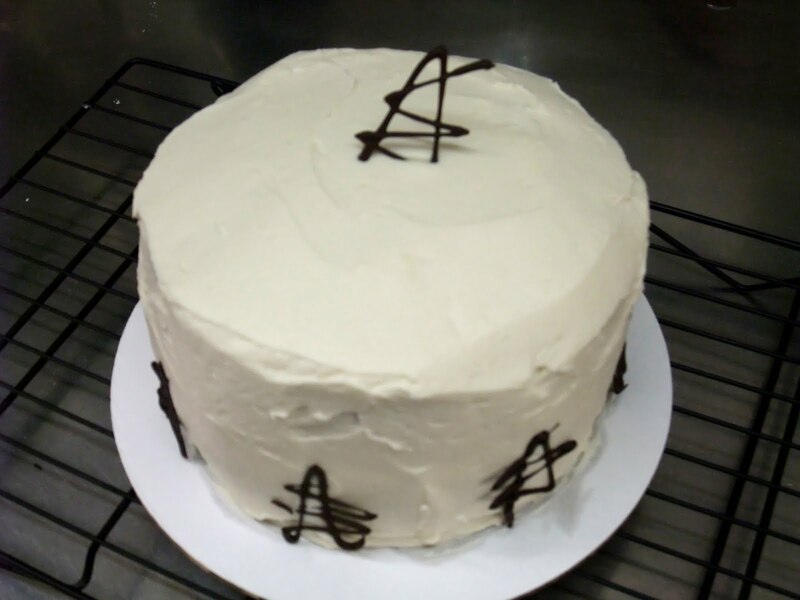 6" 2-layer Chocolate Cake with Vanilla Buttercream. Happy Birthday Danielle! Special ordered for you from MOM and DAD. I will be at the WVUH Farmer's Market Today from 11-3. Muffins, cookies, granola bars and cakes. Double Chocolate Brownies(gluten/soy free), Vanilla Cream Filled Cakes(twinkies), Cinnamon Raisin Muffins, Orange Chocolate Chip Scones, Oatmeal Raisin Cookies and Cardamom Cookies are at the co-op. Amazing Chocolate Cakes with Peanut Butter Icing are at the co-op. They also have Cherry Walnut Muffins, Ginger Peach Muffins, Macadamia Chocolate Chip Cookies, Lemon Poppy Cookies, Chocolate Mint Sandwiches and Apple Pecan Granola Bars. Last week when making Banana Cakes I ran out of buttercream on the last cake. Just a little short and I had to decide between making more buttercream or eating the cake myself. I chose the latter and it was a good decision. Chocolate Mint Sandwiches, Macadamia Chocolate Chip Cookies, Cherry Coconut Cookies(gluten/soy free), Cranberry Muffins and Vanilla Cream Filled Cakes(vegan twinkies)are at the co-op. Banana Cakes, Oatmeal Cream Pies, Chocolate Chocolate Chip Cookies, Oatmeal Cranberry Cookies, Chocolate Chip Muffins, Hearty Muffins(no salt, oil, fruit sweetened,whole grain), Cherry Coconut Muffins, Cinnamon Raisin Muffins, Granola Bars and more at the co-op. Hot Chocolate Cookies are at the co-op! They are rich, sweet, smoky and amazingly delicious. You can also treat yourself with a Chocolate Chip Muffin, Granola Bar, Lemon Poppy Cookie or Gluten Free Chocolate Cake covered with Ganache. Ginger Peach Muffins, Cherry Coconut Muffins, Oatmeal Cream Pies, Pumpkin Spice Cookies, Double Chocolate Brownies(gluten/soy free) and Coconut Lime Cakes are at the co-op. Stop by to pick up some treats! I'll be at the WVUH Farmer's Market today 11-3 with a table full of treats. It's in the parking lot next to the cancer center entrance. Yes, the title says Pumpkin Spice but I actually can't find the photo I thought I had. Pumpkin Spice Cookies are making their first appearance of the season. Peanut Butter Chocolate Chip Cookies look amazing anyway. You can find both of these at the Co-op. They also have Oatmeal Cream Pies, Apricot Almond Cookies(gluten/soy free) and Toasted Coconut Cream Filled Cakes! Stop in for a treat. Chocolate Mint Sandwiches, Double Chocolate Brownies(gluten/soy free), Chocolate Cherry w/ Toasted Almond Cookies, Granola Bars, Cranberry Orange Muffins and Lemon Cadets(lemon cake, lemon custard and vanilla buttercream) are at the co-op. I'll be at the WVUH Farmer's Market today 11-3 with a table full of treats. Lemon Cadet Cakes, Double Chocolate Brownies(gluten/soy free), Cherry Coconut Cookies(gluten/soy free), Oatmeal Cream Pies, Muffins, Granola Bars and more! Stop by to hello.